Cardbending is an original fan-made collectible card game-style game that is inspired by the world of Avatar: The Last Airbender. Here you will find the rules and all cards available to print and play. What you see here is a first draft and considered a work in progress, though still playable. I have ideas to improve this but do not currently have much time to commit to working on it. If you would like to work on this project with me to make it as great as possible, please contact @SkudPaiSho on Twitter or join me in a game of Pai Sho which will allow you to chat with me. Click here to download the pdf of all the cards (when printing this, print at 75% scale so they are not too big). Click here for an overview of the cards to learn how to read them. Click here for example deck lists. You should have one Jing Stack – a deck of Jing cards with equal number of positive, negative, and neutral Jing cards (at least 10 of each). Shuffle the Jing stack and place it face down on the table. The Jing Stack is shared between players. Shuffle your deck and place it face down. It is good to have some sort of marker as a turn counter that can be used to mark who is going first during a turn (obviously you should use a White Lotus tile). To determine the Jing Count of the Battle: The player whose turn it is flips Jing cards from the Jing stack until both a positive Jing and a negative Jing card have been flipped, or five cards have been flipped. This number is the Jing Count for the upcoming Battle (it will be between 2 and 5). The Jing cards used to determine the Jing Count are discarded. Each player, starting with the player who is going first this Battle, takes a Battle Preparation turn. Next Battle Preparation, the other player goes first. Draw X cards from your deck into your hand, where X is the Jing Count. Draw a card from your deck into your hand. Play a Meditate or Equip card, and exert the required Chi. Play a Character card as an inactive character (if at any time you have only one character in play, that character becomes your active character). Play X Jing cards face down in a row in front of you, where X is the Jing Count. After both players have finished their Battle Preparation turn, the Battle begins. Players flip their first Jing card over, so that it is face up. The next player announces the move he will be using this Jing in the same way. Effects of moves are applied, unless they state that they are not applied until after damage. Damage is calculated and applied. To calculate the damage done to your opponent’s character, subtract the defense power of the move they made from the damage power of your move. Place damage counters on the characters to show how much damage they have. Play the rest of the Jing in the same way until each Jing has been played. When a Character has taken damage equal to or greater than their health, they are defeated. When one of your characters is defeated, you must award your opponent a number of Chi cards equal to the Chi Loss number on your defeated character. To do this, take that number of Chi cards from your play area (you choose which Chi to give; they may be exerted) and award them to your opponent. Your opponent sets your Chi cards aside in their pile of awarded Chi cards. If there are no Chi cards in your play area, award 1 Chi to your opponent from your discard pile. If there are no Chi cards in your discard pile, your opponent looks at cards from the top of your deck until they see a Chi card. They are awarded that card and put the cards back onto your deck in their original order. If your opponent finds no Chi cards in your deck to be awarded, you lose the game. After awarding Chi to your opponent, discard the defeated character card and keep playing the Battle. If at any time during Battle you do not have a character in Battle, you must award your opponent 1 Chi. Before the game, decide to play to a certain number of points (10, for example) or until someone is out of cards in their deck. If playing until empty deck, the game ends when a player has 0 cards in their deck at the beginning of a Battle Preparation turn before drawing any cards. The player who has been awarded the most Chi at the end of the game wins. Jing: Jing cards are kept in a separate pile, called the Jing stack. The Jing stack is shared between players during the game. A Jing represents the way the Characters are directing their Chi in the moment. Types of Jing are Positive (associated with attacking), Negative (associated with defending or evading), and Neutral (associated with patience and waiting). 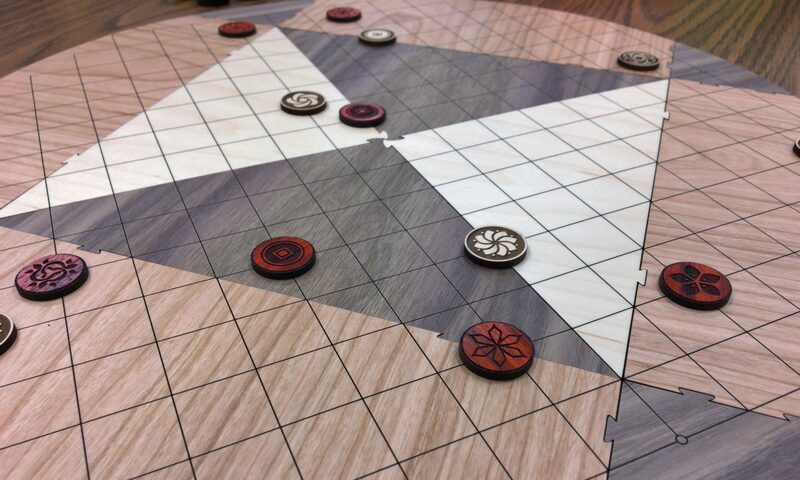 Jing cards are played during Battle Preparation face down in a row in front of the player. Chi: Chi is the energy required to make moves in Battle or during Battle Preparation. Characters: Character cards represent various characters who participate in Battle. Players must have an active character in play during Battle (if they do not, the player must award his opponent with 1 Chi). Players may have 1 active character and up to 3 inactive characters in play. Meditate Cards: These are effect cards associated with Neutral Jing. Meditate cards can be played during Battle Preparation or during a Neutral Jing of Battle. They have Chi cost that indicates the Chi that must be exerted to play the card. Equip Cards: These are effect cards associated with a type of Jing indicated on the card. They may be played during Battle Preparation or during a Jing of matching type in Battle. They have a Chi cost that indicates the Chi that must be exerted to play the card. Increase Cards: These are effect cards associated with a type of Jing indicated on the card. They may be played during a Jing of matching type in Battle in addition to a move on the active character in order to increase the power or effects of that move. They have a Chi cost that indicates the Chi that must be exerted to play the card. Attack Cards: These are effect cards associated with Positive Jing that can be used by an active character in place of a Positive Jing move on the character card. They have a Chi cost, effect, and possibly attack power, just like a move on a Character card. Defend Cards: These are effect cards associated with Negative Jing that can be used by an active character in place of a Negative Jing move on the character card. They have a Chi cost, effect, and possibly attack power, just like a move on a Character card.